We all think TEKCamp is pretty special and we're not alone - just ask anyone who has attended a previous event and they too will tell you just how great it really is! We've tried our best to communicate what makes TEKCamp so very unique but we understand that you may still have questions. Hopefully you'll find the answer to those questions below - if not, send us an email or call us on 01373 814666 and we'll try our best to answer your query! Alternatively, you'll find a lot more information over on our Facebook page. We appreciate that attending TEKCamp is a genuine leap of faith for many, especially if you have no prior tech experience. below we've tried our best to cover many of the common questions we encounter but this is far from an exhaustive list. If you don't find the answer you're looking for then do not hesitate to get in touch - as the old saying goes, the only silly question is the question you don't ask! Where does TEKCamp take place? 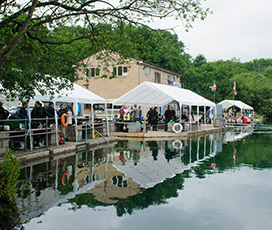 TEKCamp is held at Vobster Quay - a popular inland diving centre located in the heart of the Somerset countryside. 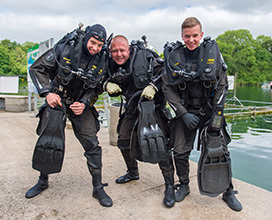 Built around a 36 acre fresh water lake offering a range of depths suitable for diver training, Vobster is the perfect location for an event like TEKCamp. 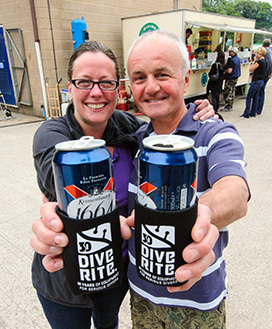 Everything you'll need for the duration of the event is available on site - from food, gas fills, kit hire and even a dive shop stocking a range of technical dive gear should you feel in need of a spot of retail therapy. What are the prerequisites for attending TEKCamp? You don't need any prior exposure to tech training to attend TEKCamp - all we ask is that you're trained to at least Rescue Diver (or equivalent) level and that you hold a nitrox certification. If you're not already nitrox certified, Vobster Quay can offer nitrox training prior to the commencement of TEKCamp. Due to the number of repetitive training dives you'll be conducting at TEKCamp, all dives must be carried out using a nitrox breathing mix with a minimum oxygen content of 28%. We do this to ensure your safety as residual nitrogen will build up steadily as the event progresses. Your body will thank you! All equipment that you use at TEKCamp must be CE-APPROVED. In addition, we also ask that your diving cylinders are IN TEST & O2 CLEAN. Divers that arrive at TEKCamp with gear that does not meet these requirements will need to use alternative equipment in order to participate. If in doubt, call us on 01373 814666. Can I still attend if I don't own my own tech gear? 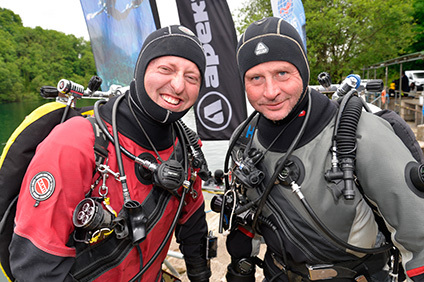 Thanks to our friends at Apeks UK, we have a limited supply of tech equipment available for those that are yet to purchase their own - Apeks will loan you a full set of twinset or sidemount gear to use throughout TEKCamp week FREE OF CHARGE! Just bring your drysuit, fins and mask and we'll sort out the rest. You'll get to try both configurations and then choose which one you'd like to use for the rest of TEKCamp - there's never been a better way to discover your pathway to tech success! Spaces are very limited and we've only got a limited number of full sets of gear available so if you want to take advantage of this amazing opportunity, book now to avoid disappointment. 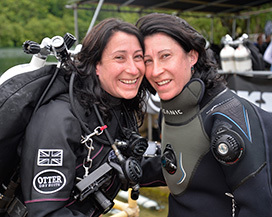 If you already own your own twinset or other technical diving equipment, we actively encourage you to bring it along as our instructors can provide valuable feedback and advice on how best to configure and use it. As we ask is that your equipment is CE-APPROVED and your tanks are IN TEST & O2 CLEAN. If in doubt, call us on 01373 814666. How long will I get with each instructor? Every attendee to TEKCamp will enjoy two diving workshops each day with different technical instructors, giving the broadest exposure possible. On each workshop, you and a maximum of three other TEKCamp attendees will spend a minimum of three hours with a member of our instructing team as they take you through a range of essential technical diving skills - from equipment configuration, finning techniques and pin-point bouyancy control to line laying and stage bottle management. Visit the workshops page for full details of the training opportunities available. Can I specify which instructors I get to dive with? In order for attendees to get the maximum benefit from TEKCamp, we work hard to ensure that everyone gets to dive with as many of our technical instructors as is possible during their time at TEKCamp. To ensure maximum exposure to a broad range of different agencies, skill sets and teaching styles, allocation of spaces will be carried out by the organisers of TEKCamp based on a number of factors including the attendees' progress during the event and the type of TEKCamp ticket booked - options will be more limited if you only book a two day ticket. Whilst we try to ensure that attendees get to dive with their preferred instructors, this cannot be guaranteed. If you have a particular preference, let us know prior to the start of the event - we'll always do our best! 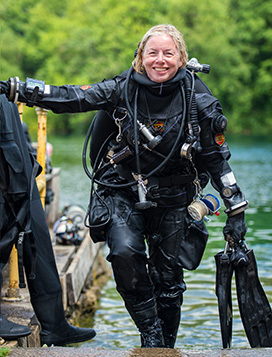 Can I use my rebreather at TEKCamp? 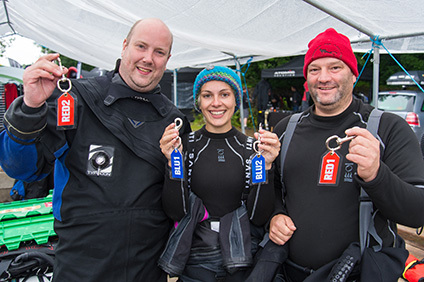 TEKCamp isn't just for divers on open circuit equipment - we now have a rebreather programme too! 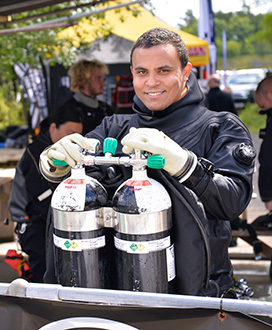 Whether you're an experienced rebreather diver or still getting to grips with your unit, TEKCamp is an unmissable opportunity to learn from some of the most experienced and knowledgeable rebreather instructors and instructor trainers in the world! 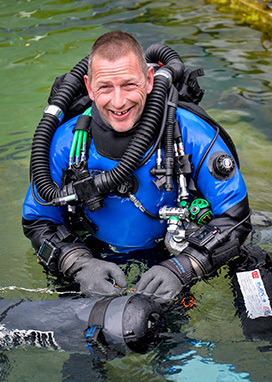 Our team of TEKCamp rebreather instructors are at the very cutting edge of rebreather training and actively use rebreathers within their own exploration-level diving projects. 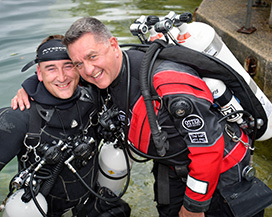 Many of our talented team have been involved in the development of rebreathers from the very beginning and have worked closely with the manufacturers to develop the units we have today. 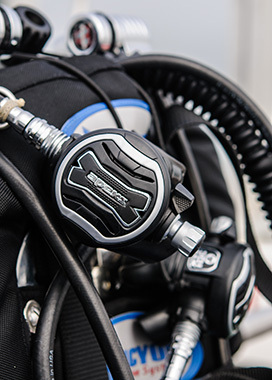 We accept most makes and models of closed circuit rebreather at TEKCamp - our only prerequisites are that your unit is CE-APPROVED and the unit's O2 cyclinder is IN TEST & O2 CLEAN. Your unit's diluent cylinder should be IN TEST too. If in doubt, call us on 01373 814666 or email tekcamp@vobster.com. Can my buddy and I dive together in the same workshops? Absolutely! 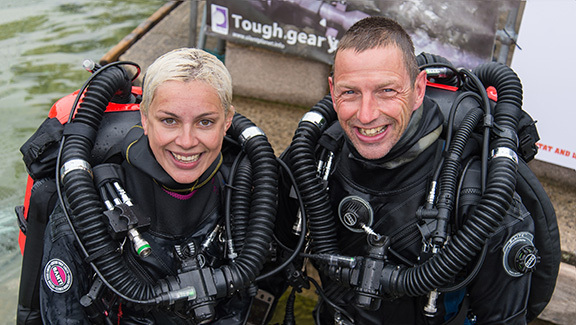 In fact we actively encourage regular dive buddies to attend TEKCamp together as you'll both gain maximum benefit by taking what you learn forward into your own diving. 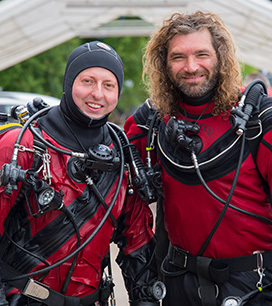 If you're already committed to TEKCamp, why not encourage your dive buddies to sign up too? TEKCamp is even more fun when shared with friends! If you and your buddy do wish to dive together at TEKCamp, simply sign up and then email us at tekcamp@vobster.com and we'll try to pair you both together. Whilst we can't guarantee you'll be together on every workshop, you can be sure that we'll do our best to make it happen. Can I sign up for just one day? Unfortunately not. We believe that in order for an attendee to get the most out of TEKCamp, you need a minimum of at least two days if not more. The training offered at TEKCamp builds up progressively with each day building on the training from the previous day. Not sure what option would work best for you? Visit our TEKCamp ticket options page for more information on the full range of tickets available. We're sure you'll find one that's right for you. What about accommodation during TEKCamp? Need somewhere to stay during TEKCamp? We've arranged with a local farm to offer to TEKCamp attendees FREE CAMPING for the duration of the event. 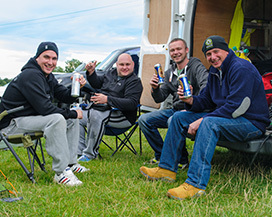 Attendees will be able to pitch up their tent or caravan within easy walking distance of Vobster Quay. Vobster Quay will be staying open late each evening to allow TEKCamp attendees to take advantage of the shower and changing facilities. In addition, the campsite itself offers basic portaloo facilities and running water. If you'd prefer something a bit more luxurious than a farmer's field, a full list of local accommodation can be found on the Vobster website. What other costs will I incur in addition to the ticket price? We like to think that TEKCamp represents excellent value for money which is why we've built most of the costs into the ticket price - amongst other things, your ticket includes a tasty BBQ each day and even overnight accommodation at a nearby camping field! Naturally there are other costs to consider when planning your trip to TEKCamp. Based upon previous events, the average outlay per TEKCamp attendee attending for the full 4 days was just £30.00 for additional food and drink. A tasty BBQ each day is included in the ticket price however you will need to pay for your own breakfast, lunch and drinks at TEKCamp. The one cost you don't have to worry about is your gas - cylinder fills throughout TEKCamp are included in the ticket price. For those of you diving on a rebreather, we've also included sorb fills too! These figures are presented purely as examples - those with an appetite for chocolate bars and tech gear retail therapy may find their bills a little bit higher!